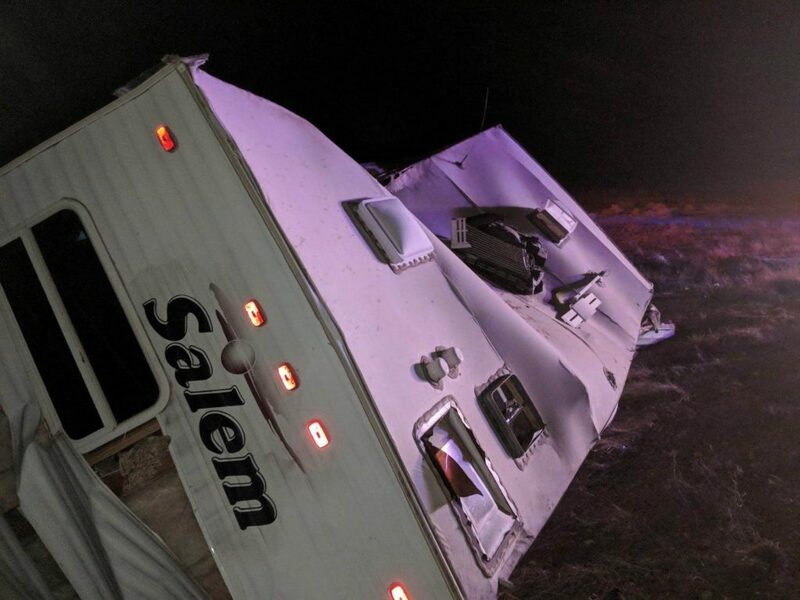 ST. GEORGE — A rollover on Interstate 15 in Littlefield, Arizona, Thursday left the driver injured while the travel trailer her vehicle was pulling splintered into pieces after wind caused the SUV and trailer to roll multiple times after leaving the roadway. Officers and emergency personnel responded to a crash just after 6 p.m. MST on I-15 southbound near mile marker 12 involving a red Chevrolet Trailblazer pulling a Salem travel trailer, Arizona Department of Public Safety trooper John Rogers said. The woman was stabilized at the scene and transported to Dixie Regional Medical Center by ambulance. The Chevrolet’s roof was caved in, which shattered the windshield. 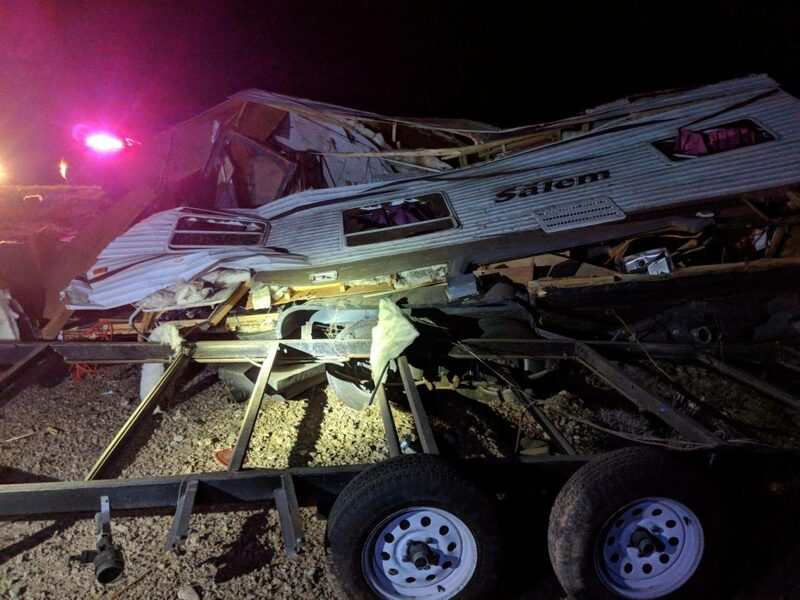 The travel trailer had separated from the steel base as it split apart and was found lying in pieces strewn across the crash scene. 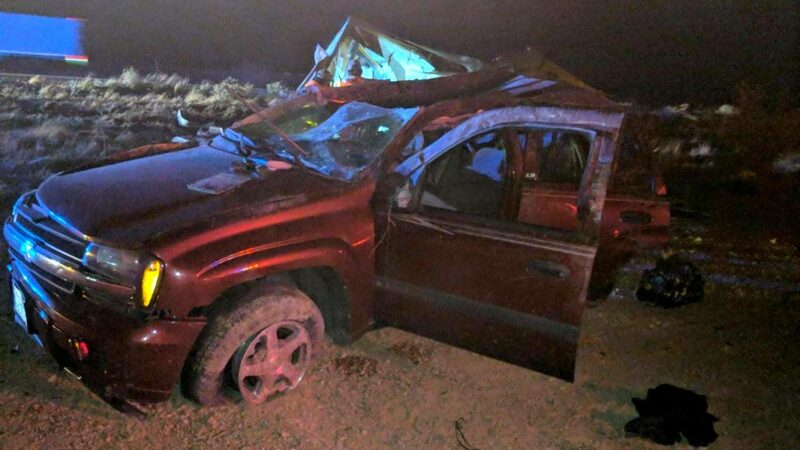 Rogers said the woman was heading south toward Mesquite, Nevada, and just as the SUV “came out of the Gorge, the trailer started fishtailing.” The SUV couldn’t stabilize the trailer that whipped around and pulled the SUV to the right until both left the roadway and rolled. “That trailer was fairly large and it was just too much weight for the tiny SUV,” Rogers said. The woman lived in the travel trailer, which was destroyed, as were many of the items inside. Dixie Waste responded with a dumpster and assisted responders in loading the shattered debris. Bracken Towing removed the vehicle. The woman was treated at the hospital for a “small brain bleed and a tiny hole in her lung,” Rogers said. Both conditions were resolved overnight and she was expected to be released Friday evening. The woman was cited for driving too fast for conditions.